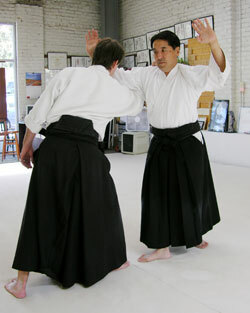 One element of Saito Sensei's Aikido that perennially stands out is his emphasis on the technical parallel between empty-handed Aikido, or Tai Jutsu, and Aiki Weapons practice, or Buki Waza. Goto Sensei often says, "I used to think that maybe he meant this as a metaphorical parallel, but later I saw that it is a literal parallel: they are the same." Saito Sensei would say, "Your Tai Jutsu should look like your weapons practice, and your weapons practice should look like your Tai Jutsu." This parallel, embodied not only in Saito Sensei's Aikido, but that also of Shirata Sensei and his students, is called "Riai." As we practiced Irimi Nage today from a rear attack, "Ushiro Eritori," Goto Sensei stopped us to demonstrate the buki waza parallel of the movement we were trying to do. He told us to go get a Jo from the weapons rack, and when we'd returned to the mat instructed us to do the Jo Suburi "Hasso Gaishi Uchi." 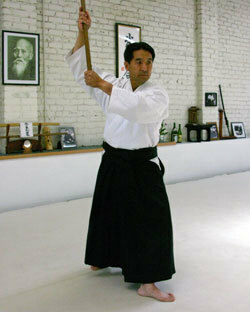 After a few reps of this he told us to execute move number 5 in the 13 Jo Kata. This is also a Hasso move but it turns all the way around to the rear. It's basically like doing a two-step while performing a deflection and chambering a strike with the Jo at the same time. After a while Goto Sensei still wasn't satisfied with our weight placement, it was still to far back, making the entry for the Hasso deflection weak. He stood behind us one at a time and extended his Jo for us to deflect physically as our bodies turned to the rear. Sure enough we entered to do the deflection with our weight more forward and the Hasso was strong. "Now go back to doing the Irimi Nage but using the same foot and hip movements as you did with the hasso move from the 13 Jo Kata," Goto Sensei said. The deflection of the jo morphed into the part of Irimi Nage where you step behind Uke and capture the back of his gi, taking his head to your trailing shoulder. If you don't enter here but keep your weight back, Irimi Nage just falls apart and disappears. I tried to focus on rotating my hips all the way around and striking through at the end after Uke's center passed beneath my own center. I found that I was impatient and seemed to be striking a little too early, before Uke was completely folded under me. Then Uke was a little heavy and I had to use some force to throw him down, but if I waited a little longer Uke became light and folded naturally into the fall. Out of the corner of my eye I noticed that, when the throw was heavy I hadn't rotated my hips all the way back and my feet were not in hanmi. Kagami Sensei, the mirror, never lies. 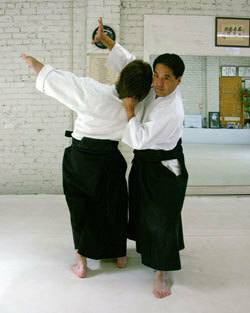 After class Goto Sensei passed on something else that Saito Sensei had told him. "I will give you the pieces, but it is your job to put them together." Goto Sensei had given us some pieces today, just as his teacher had done for him a generation ago. Saturday morning the parking lot at Tatoian Sensei's dojo in Santa Rosa was filling up by the time I got there 15 minutes before class. 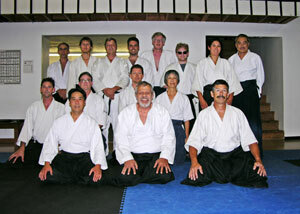 It was Field Trip Day for Bay Marin Aikido, and Goto Sensei and his students were there to pay a visit. What none of us could have predicted was that Jay Bell Sensei, an old student of both Tatoian Sensei and Goto Sensei, now teaching on his own in Santa Rosa, would also show up to train. Tatoian Sensei has been preparing for another trip to the Phillipines, where he has an enthusiastic following, and lately he's been teaching some of Saito Sensei's more offbeat stuff. One item among these is the "escape from four attackers and stack them in a pile" technique. 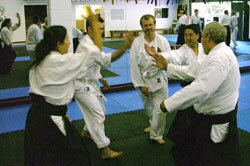 On Saturday, after Tai no Henko and Morote Dori Kokyu Ho, Tatoian Sensei treated his visitors to a class in this technique. In the shot above, Stephen escapes behind Goto Sensei, and below Bell Sensei has fun stacking his ukes. What you do is stand in the middle of a group of four attackers, each at compass points and within striking distance, and wait for them all to initiate a shomen strike at your head. Then, before anyone can hit you, you slip out of the circle and get behind one of the attackers, throwing him or her irimi nage. Once the first one is on the ground you have to make the others strike at you over the first body so you can perform a kokyu nage or irimi nage on them and pile them up on top of one another until they're all in a stack. From there you can hold the top one down so that the rest can't get up. It's hysterically funny the way Tatoian Sensei does this, smiling like a Cheshire Cat while feet and arms of ukes are squiriming out from the pile. There was a lot of groaning from the bottom layers of the piles. After a while of this Tatoian Sensei made us change it so that the attackers all came from the front, striking all at once. 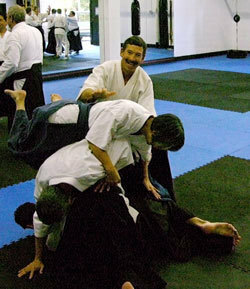 He showed how you can lock them up as a four-headed uke and throw the whole pile irimi nage. That variation was beyond most of the rest of us, so we tried to get them two at a time, which actually worked now and then. To me this technique embodies Saito Sensei's rule of managing randori by staying pretty much in one spot and letting attackers come to you. 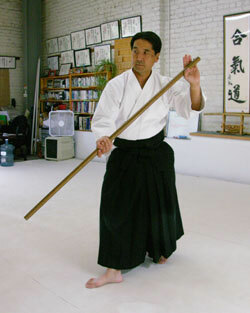 Saito Sensei would just move his hips around and people would fly like mud off a spinning axle. Tatoian Sensei would always yell at me when I'd go off on search-and-destroy missions during randori. I was always thinking to basically hunt the attackers down, but Tatoian Sensei said, "that's too much work, and anyway, they're the ones attacking." It was in this spirit that he always taught this technique. Below is a photo of the whole group after class.